Phone Wraps : ihatestickers.com, Your number one online source for edgy stickers. Great quality work and fast shipping! This is the cheapest p .. 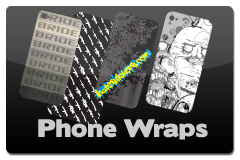 These are our phone wraps that we offer for various smartphones! We currently offer them for the iPhone and Galaxy Note, but we're always adding more phones to the list. Be sure to let us know if you'd like a wrap made for your model phone! We also can do custom phone wraps for you business or car club! Bride-styled gradient phone wrap. Printed on EZ-INSTALL wrap vinyl. Choose the type of phone you would like the wrap for from the selection below!! Faces Sticker Bomb Phone Wrap. Printed on high quality EZ-INSTALL wrap vinyl. Choose the type of phone you would like from the selection below! Keep Calm And Carry On Phone Wrap. Printed on EZ-INSTALL wrap vinyl. Choose the type of phone you would like the wrap for from the selection below! !